Going to college can be a daunting prospect for any young person, but for teenagers on the autism spectrum this is especially true. 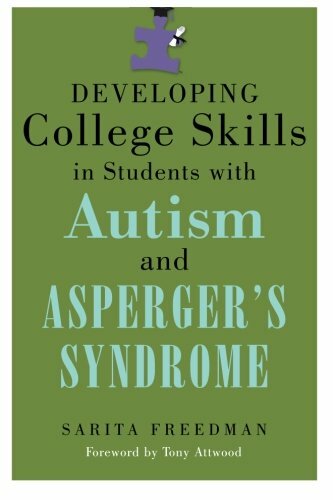 Developing College Skills in Students with Autism and Asperger’s Syndrome describes the unique needs that ASD students entering further or higher education are likely to have. Sarita Freedman identifies several necessary skill sets, along with effective intervention strategies for facilitating skill development throughout the student’s elementary, middle and high school years. Several specific accommodations, supports, and classroom/teaching strategies that benefit students with ASD need are presented. Finally, Dr. Freedman suggests a number of changes for streamlining public service delivery systems so that future students with ASD can be better prepared for their adult lives. This book provides invaluable ideas and suggestions for any professional working with individuals on the autism spectrum including, mental health professionals, special educators, educational therapists, speech and language pathologists, occupational therapists, high school and college counselors. Parents and other caregivers of individuals with ASD will also appreciate learning about the various skill sets and the developmental manner in which they are presented.